A wing part was found two weeks ago. 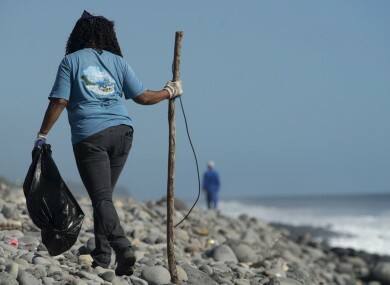 A Municipal worker searches Reunion Island beaches last week. FRANCE HAS SAID said it is calling off the hunt for wreckage from missing flight MH370 after 10 days of air and sea searches off its Indian Ocean territory of Reunion yielded no results. The island’s top authority however said its search teams would maintain an attitude of “vigilance”. A wing part washed up on the island on July 29 and was confirmed by the Malaysian prime minister to be part of the Boeing 777 which went missing on March 8, 2014 with 239 people onboard. The find raised hopes of finally solving the mystery of what happened to the plane, prompting investigators to search a maritime surface of 10,000 square kilometres (3,900 square miles) and scour the island’s eastern coastline. But the searches “have not led to the identification of anything that could have a link with a plane,” the French state’s representative on the island, Dominique Sorain, said in a statement. Email “MH370 latest: Réunion calls off search for wreckage - but will stay 'vigilant'”. Feedback on “MH370 latest: Réunion calls off search for wreckage - but will stay 'vigilant'”.